Editorial: How do we define a manuscript as suitable for a journal targeting general practitioners? Objective: The aim of this ex-vivo study was to evaluate both the external and the internal penetration ability of a resin infiltrant into natural proximal and macroscopically intact white spot lesions, and to merge this approach with the internal tunnel preparation concept. Method and Materials: 20 premolars and 20 molars with proximal subsurface lesions (ICDAS, code 2) and respective radiographic lesion depths extending into the middle third of dentin (D2 lesions) were selected and divided into two groups. Treatment needs were confirmed using digital imaging fiber-optic transillumination and laser fluorescence. Deproteinization (NaOCl; 2%) followed, and lesions of Group 1 (control; n = 20) were etched (HCl; 15%) and externally infiltrated (Icon). Accordingly, the specimens of Group 2 (n = 20) were treated with the resin infiltrant from external; then, internal Class I tunnels were prepared, lesions were internally infiltrated (Icon), and the occlusal cavities were restored (G-ænial Flo X) after etching (H3PO4 gel; 40%). Teeth were cut perpendicular to the proximal lesion surfaces, and percentage infiltrations were analyzed using confocal laser microscopy and a dedicated image manipulation program (GIMP). Results: Regarding the external infiltration, no differences between both groups were detected (P = .114; Mann-Whitney). Additional internal application of the resin infiltrant significantly increased the percentage amount of enamel lesion infiltration (P < .0001; Wilcoxon). Conclusion: External and internal infiltration seem to complement the internal tunnel approach, thus remediating the drawbacks of the latter by occluding and stabilizing the porous areas of the proximal caries lesion, and preserving both the marginal ridge and the proximal contact area. This article presents the historical development of the different generations of zirconia and their range of indications, from veneered to monolithic zirconia restorations. Because of the large extent of this topic, it is divided into two parts. In Part I, the mechanical and optical properties of the three generations of zirconia materials are discussed critically and theoretically. A short summary is given of the current scientific literature, investigating the third generation of zirconia comparatively regarding the properties discussed. 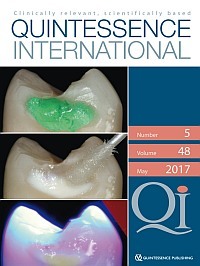 Objective: This retrospective study aimed to evaluate the long-term response of molars affected with severe periodontitis to periodontal treatment, to analyze the differences in response between molars with and without furcation involvement (FI) and to reevaluate the usefulness of the existing classification of FI in determining the prognosis. Method and Materials: A total of 402 patients from a single private practice were included. The observation period was 27 years (mean 16.5 years). The average frequency of the supportive periodontal therapy (SPT) visits was 1.76 ± 0.57 per year (median 1.95/ year). Inclusion criteria were: at least 10 years of periodontal follow-up, at least one tooth with probing depth ≥ 6 mm, level 4 of the Dutch Periodontal Screening Index (DPSI). Results: Of the 2,559 molars present at the initial examination, 125 were extracted immediately. Degrees III or II FI were found in 37.2% molars, while 62.8% exhibited degree I or had no FI. The performed periodontal treatments were: nonsurgical therapy of scaling and root planing (77.6%), eventually repeated scaling and root planing (11.6%), access flap (7.8%), tunnellization (0.2%), and root resection (2.8%). The survival rate was 83.9% (77.5% molars with FI; 87.8% without FI). The presence or absence of FI did not exhibit a significant effect in any of the treatments provided. Conclusion: Simple treatments can successfully be applied to treat molars affected with severe periodontitis, even with FI, yielding good long-term survival rates. The classification of FI was not of great use in determining the prognosis except in case of degree III FI. Autism spectrum disorder (ASD) is a complex neurodevelopmental disorder that can affect all aspects of life, including nutrition. This case reports a patient with ASD in which gingival bleeding was the key finding that led to a diagnosis of scurvy. The literature review discusses behavioral food aversions in patients with ASD that lead to significant nutritional deficiencies, such as scurvy. Through this case report, the objective is to raise clinical awareness to consider relatively rare diseases in patients with ASD who have atypical feeding patterns. Cowden syndrome is an autosomal dominant disorder with a predisposition to multiple benign and malignant tumors with unique oral manifestations. We present a case of Cowden syndrome in a patient diagnosed with breast cancer, traumatic fibromas, bronchial asthma, and multiple papillomatous fibromatosis of the oral cavity. Close association between oral papillomatosis associated with Cowden syndrome and PTEN gene mutation may increase the risk for malignant transformation. Therefore, patients of Cowden syndrome should be monitored carefully for all kinds of cancers. Objective: To evaluate the accuracy of a questionnaire modified for the identification of intraoral pain with neuropathic characteristics in a clinical orofacial pain sample population. Method and Materials: 136 participants with at least one of four orofacial pain diagnoses (temporomandibular disorders [TMD, n = 41], acute dental pain [ADP, n = 41], trigeminal neuralgia [TN, n = 19], persistent dentoalveolar pain disorder [PDAP, n = 14]) and a group of pain-free controls (n = 21) completed the modified S-LANSS, a previously adapted version of the original questionnaire devised to detected patients suffering from intraoral pain with neuropathic characteristics. Psychometric properties (sensitivity, specificity, positive predictive value [PPV], negative predictive value [NPV]) were calculated in two analyses with two different thresholds: (1) Detection of pain with neuropathic characteristics: PDAP + TN were considered positive, and TMD + ADP + controls were considered negative per gold standard (expert opinion). (2) Detection of PDAP: PDAP was considered positive and TMD + ADP were considered negative per gold standard. For both analyses, target values for adequate sensitivity and specificity were defined as ? 80%. Results: For detection of orofacial pain with neuropathic characteristics (PDAP + TN), the modified S-LANSS presented with the most optimistic threshold sensitivity of 52% (95% confidence interval [CI], 34-69), specificity of 70% (95% CI, 60-79), PPV of 35% (95% CI, 22-51), and NPV of 82% (95% CI, 72-89). For detection of PDAP only, with the most optimistic threshold sensitivity was 64% (95% CI, 35-87), specificity 63% (95% CI, 52-74), PPV 23% (95% CI, 11-39) and NPV 91% (95% CI, 81-97). Conclusion: Based on a priori defined criteria, the modified S-LANSS did not show adequate accuracy to detect intraoral pain with neuropathic characteristics in a clinical orofacial pain sample.